Monaspa - a Georgian elite after the army reforms of David IV, the Builder (1089-1125), were composed of stout soldiers loyal to king and to the fatherland. 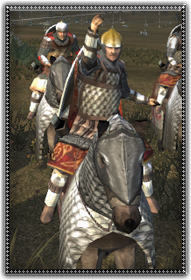 These cavalrymen are above even the normal cavalry corps of Monaspa and function as a unit to personally defend their king with lance, shield, sword, and their very lives. These Monaspa lancers are above all others in rank and prestige, given the utmost honor of defending their general on the field of battle.